It turns out that I could! I know this screenshot is vague and unclear, but trust me: it’s showing that I’ve beaten medium difficulty. Medium difficulty is actually interestingly different from Easy difficulty. For one, in Medium, you don’t actually get to see your total stock of cards. This (obviously and immediately) makes the game more difficult. But on the other hand, in Medium, the singular goal is no longer to travel X times and ‘make it to the Refuge’ before the Frost eats you. Rather, you get a set of three of three possible objectives, drawn from a set of… I think about six or seven. One of those objectives is always ‘Find the Refuge’, so you can still win the game the classical way. But you can also win by fulfilling any of the other objectives. This might mean ‘farming’ or ‘gathering’: creating many excess Food or Material cards, and then destroying those cards to count down your objective. It might mean winning many fights against enemies, or taking damage, or healing damage taken. Or it might mean spending several turns on the border of the Frost, distance 1, where any mistake will kill you dead without remorse. They all have ups and downs, I guess. What’s odd is that, on the surface, Medium difficulty is actually easier than Easy? The addition of extra objectives seems like a bonus. In my first Medium foray, the cards fell such that I got an excess of Food really quickly, allowing me to beat the ‘Farm’ objective with 16 normal travel steps remaining. And even if the two random objectives are a poor fit, you can still win the game the same way as Easy mode — find the Refuge. Medium is made slightly more difficult by removing your card stock overview, forcing you to keep track of your stuff yourself. But otherwise, they feel less like linear difficulty modes and more like preferences. Now Hard difficulty mode, that one lives up to its name. In Hard difficulty, you don’t win if you meet one of your three random objectives; you have to meet two. Which means that if you reach the Refuge without doing at least one other thing, you actually lose. That’s happened to me. You might be surprised to learn that I’ve yet to beat Hard mode. And the game’s so cheerful when you lose! Next to Hard mode, you also eventually unlock Endless mode, which… is more or less what it says on the tin. 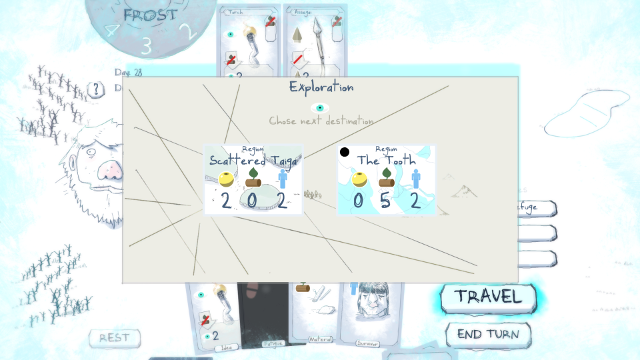 And slowly, over time, specific scenarios start appearing under the Scenario card. As far as I can tell, these all seem like normal games with a twist. 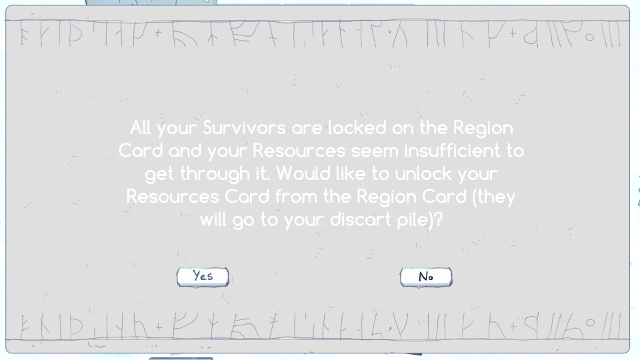 In the first scenario, for instance, you play as the head of a family: you have to reach the Refuge, but you cannot in any way lose one of your three special marked Survivor cards. This sounds very straightforward and is surprisingly difficulty; I’ve yet to successfully beat any of the scenarios, either. Is it *my* fault tundra wolves like the taste of mission-critical family members? Frost, it turns out, is a right unforgiving game. I’ve played a good two full hours of it, and (discounting the rigged tutorial) I’ve only won one game. This is partially my fault and partially the game’s, and yes, I am aware that sounds like blame deflection. But sometimes Frost is difficult because it asks for hard tactical decisions with little certainty and foresight, and sometimes it’s hard because it withholds vital information and relies on luck-of-the-draw. And the two can’t always be meaningfully separated. Frost is very hard because Frost wants to be very hard, and that doesn’t always leave room for subtlety. But is Frost fun? Do I recommend getting it, playing it, sinking time into it? I’m going to say yes, probably, asterisk. I’m going to say this asterisk out loud, so you know how important the coming caveat is. 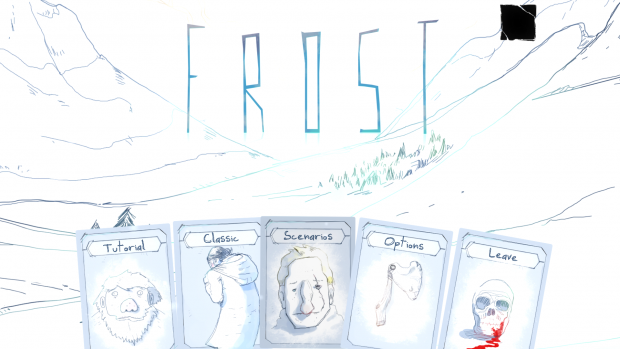 Frost is a decent game, well-designed and easy to learn, and with an interesting ‘frozen wasteland’ aesthetic that permeates not only visual and sound design, but also tone, narrative, and even mechanical balance. Frost is what happens when you design a game around a theme and take the time to ensure that everything matches. But, because of the interaction between core gameplay loop and theme-appropriate design decisions, Frost is also brutally hard sometimes. And not just hard, but randomly hard, frustrating-feeling and unfair. And that’s not everyone’s cup of tea. Frost‘s tutorial does a good job of introducing the core gameplay loop and most of the mechanics, but I’ll reiterate here for the sake of recency. 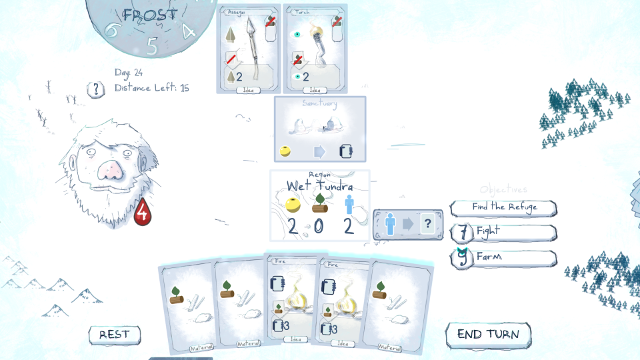 Frost is essentially a deckbuilding game about surviving a frozen wasteland. You start with a small ‘core’ deck consisting of Food, Material, Survivor, and Fatigue cards. Every turn you draw five of your cards, and you use those cards to make your way across the wastes. Cards are used to travel Regions, to defeat Challenges, to activate Events, and to collect Ideas. The latter two very often lead to more cards being added to your deck, growing it over time — that’s why we’re calling it a deckbuilder. 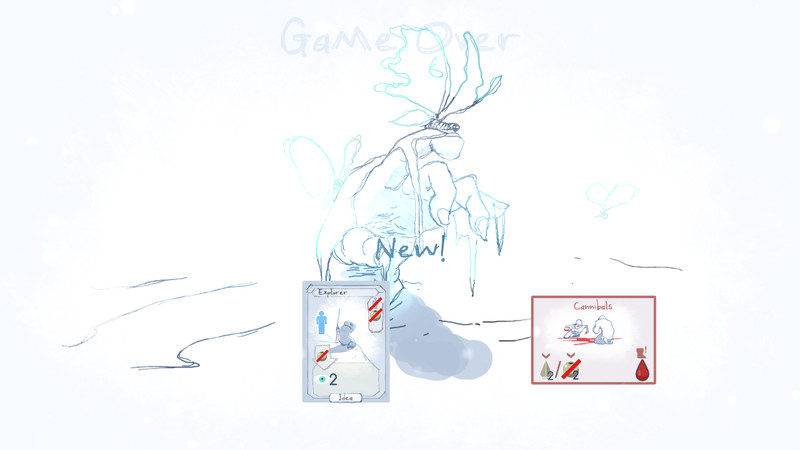 Immediately, though, Frost‘s mechanics deviate from established deckbuilder norm. In most deckbuilding games, the cards you start with are intentionally the weakest, most worthless cards in the game. The goal is often not just to add more powerful cards to your deck, but also to cull weaker ones, raising your effective power over time. For instance, it’s not rare in Star Realms to see a player lose all their starting Scouts and Vipers over the course of several turns. Turns and card draws are a commodity in deckbuilding games, and the less of those you ‘waste’ on poor starting cards, the better you’re doing. But Frost doesn’t roll this way. 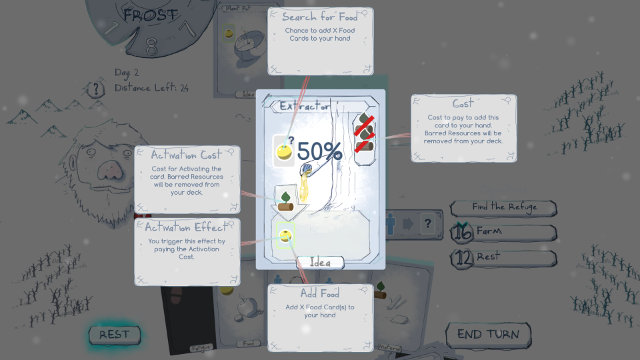 In Frost, your ‘starting cards’ — Food, Materials, and Survivors — are some of the most important cards you can draw. You need specifically these cards to travel Regions and progress, which means you need them to win the game — and that’s before you get into the side objectives that eat these cards for victory. So you won’t be trying to ‘ditch’ these starting cards. In fact, generally, I found myself ending up with more and more Food, Materials, and Survivors, going from a measly 2 starting Food to a dozen golden apple cards or more. 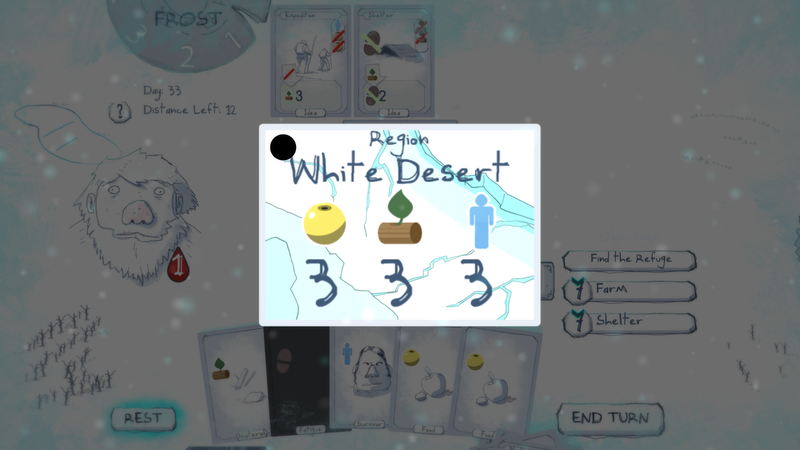 I suppose Frost was more right about itself at the start than I gave credit for: it’s really less of a ‘deckbuilding game’ and more of a ‘card deck management game’. Being good at Frost involves carefully balancing the types and numbers of cards that go into your deck. Many of the Events and Idea cards you get explicitly serve to give you new cards. As does the whole ‘scavenging’ mechanic. Not just new resources, to be used temporarily: entirely new cards. For instance: every time this Extractor is used, it has a 50% chance of generating a new Food card. If it’s used in conjunction with a Material, that chance goes to 100%. It’s easy to see how your deck grows and grows as a result of this. In balance, actually getting those Events and Ideas often involves permanently sacrificing certain cards. The Extractor shown above eats two Material cards forever. There’s a card called ‘Cannibalism’ that lets you permanently turn one Survivor card into two Food cards. And some of the possible victory objectives require dozens of Food or Material cards to be sacrificed. It calls for a tricky balance. You’ll often want to keep adding new Idea cards to your deck, because Ideas are usually good and powerful. But a deck with just Ideas and no basic resources won’t allow you to travel anywhere. You’ll need to make sure your Food, Material, and Survivor numbers stay high as well. Not too high, or you’ll never draw your Idea cards when they matter. But not too low either, or you’ll simply get stuck. 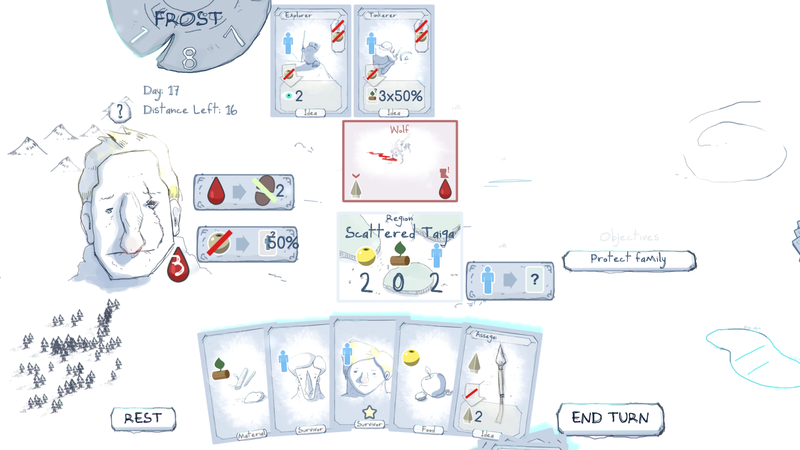 I say that Medium difficulty’s extra objectives almost make it easier than Easy, but Easy’s card stock overview is a massive help to play Frost right. With it, you can clearly see which basic cards you have in which abundance, and adjust accordingly. Without it, you’ll have to rely on your own mental model. And unless you have photographic memory — or a willingness to open a side Excel sheet and start marking, I guess — this can be very difficult. Card effects can come hard and fast, particularly with the later, more powerful Idea cards. For me, at least, it was all too easy to lose track of how many of anything I had. And then you just have to start playing ‘by ear’. This becomes an obvious problem when you suddenly only have 6 Material cards on a deck of 30. And then you need 5 of them to pass one Region. And the Frost is hot… er, cold on your heels. You know what, I’m just gonna select that *other* region. Now, so far, the difficulty issues I’ve been describing are all me. Which is to say, they’re all player-based. It is possible to keep track of all your cards, and try to maintain a healthy balance between them. I can ding Frost for not always giving me the tools to do what I want, but me failing to use those tools when they’re given — I’ll accept that as my fault. But Frost doesn’t get off the hook for everything. On the non-Easy difficulty levels, the focus on deck opacity is such that even with good effort and intentions, it can be really difficult to track what is happening. Cards beget cards beget cards beget cards, particularly when scavenging. The large number of cards with percentage-based random effects doesn’t help. And with turns coming hard and fast, it isn’t always easy to track which cards have already happened and which cards are yet to come. You are allowed to look through your own discard pile, but during normal play this area is hidden below the bottom of the screen. Crucially, you’re not allowed to look at your deck. I mean, obviously you can’t peek. But a game like Star Realms at least allows you to see which cards in general are in your deck. Frost demands that you keep track yourself. While Frost purports to focus on a dynamic equilibrium — gaining and losing cards to stay at a net ‘balance’, instead of the static equilibrium of never gaining and never losing cards — in practice, there is much more influx than outflow. There are very little ways to ‘just’ scrap cards. Ideas can often be scrapped for some effect, but that effect just gets you more cards. Same with Events, which tend to eat cards for benefit. Only the optional ‘harvest’ objectives are actually resource sinks. Everything else is at worst an uneven trade. So by and large, you’ll gain cards over time. There are only two cards in this whole set that legitimately *lower* your card count. In theory, you can go through your entire deck and use all your nice cards with time. But as I’ve said, time and card draws are valuable in deckbuilding game. Moreso in Frost than in many other games. Every turn you spend not outrunning the Frost allows it to catch up on you. Every sub-optimal draw brings death closer. Only if you immediately draw what you need to clear a new region can you effectively increase the counter. And here, Frost‘s game mechanics combine to reach what’s probably the single most frustrating thing about it: the further you get in the game, the more success and survival start coming down to luck. In a large deck, even a well-balanced one, there’s an ever-increasing chance that you’ll just draw bad hands for your situation. Because (obviously) your hand size never increases! On a starting deck of 10 cards, a hand size of 5 is a reasonable bite. But on a deck size of 20, 30, 40… At some point you just can’t rely on getting what need in time anymore. Even if you have it in storage, that by no means translates to having it in your hand. 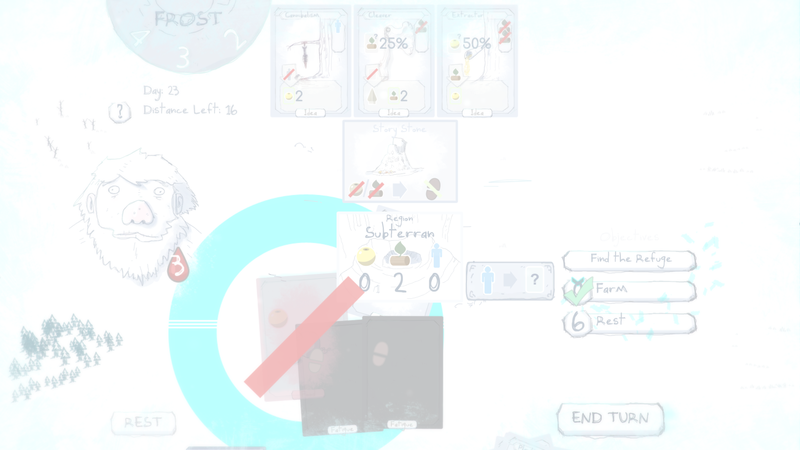 And I’ve lost count of the number of games I’ve lost to the encroaching Frost, simply because I couldn’t get the right card at the right time. Yes, this is the same screenshot from above. But now look at it with different eyes. Notice the Frost counter sitting at 1. Notice the 1 Food needed to traverse. Notice my hand. Randomness is always inherent to card games. I understand that, I accept that. And part of getting good at deckbuilding games is ‘playing’ that randomness: tweaking the statistics of your deck to increase the chance of favorable draws. But in spite of its theme of frozen desolation and scrabbling-for-survival, Frost‘s mechanics seem to push you towards an uncontrollable horn of plenty. And it takes some of the enjoyment out of Frost‘s cool overlap of aesthetic and theming when the mechanics seem custom-built to disallow me to do what I really want to do: make any sacrifice necessary to survive the winter. Or maybe I’m just really bad at playing it. Don’t discount that option either. What kind of doofus can’t even make it past this perfectly-balanced obstacle? 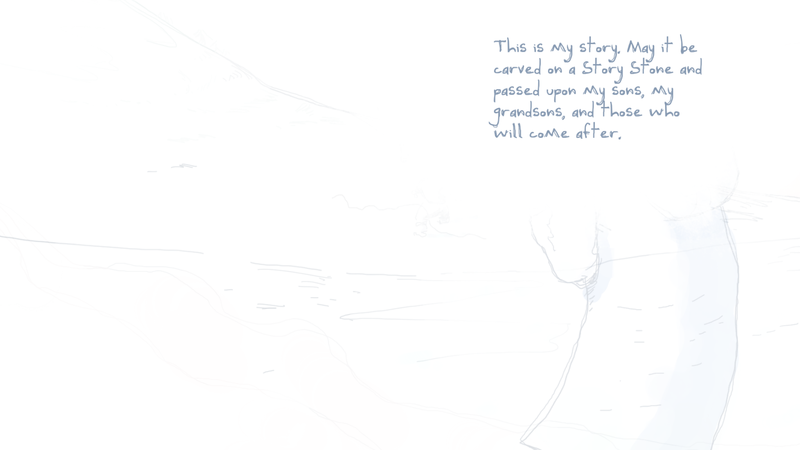 Whenever you start a new game in Frost, it opens with a little story. A man, frozen and desperate, relays the tradition of the Story Stones among his people. It’s a powerful image and narrative device: in a world forever consumed by white and cold, only stone is sturdy and permanent enough to allow these wandering nomads to record and pass on their history. It’s a pretty cool tidbit, supported by more of Frost‘s neat white-blue line art. I just wish it didn’t pop up unskippably before every single game. This is my story. You will read it about a thousand more times. Because my last few paragraphs have been a little grumbly, I want to reiterate that I do like Frost. The aesthetic alone is super interesting, a clever minimalist way of conveying themes at a glance, and particularly the sound design is great. And I do like the game’s intent, the idea of a dynamic, uncertain equilibrium of resources that you use to travel across a frozen landscape while fighting off threats and incorporating new ideas. I just question some of the design choices. Is the player not knowing their exact card count that important to the intended experience? The option being available in Easy mode seems to suggest that it’s something the designer had rather you go without. But the rapid influx of cards, limited options to cull needless cards, and a reluctance to do so when you’re not actively and perfectly tracking your deck, means that later game ‘difficulty’ — and the associated winning-or-losing — can come to down to raw luck-of-the-draw. It’s very easy to lose by not playing right, basically, but it’s very hard to win even if you play flawlessly. 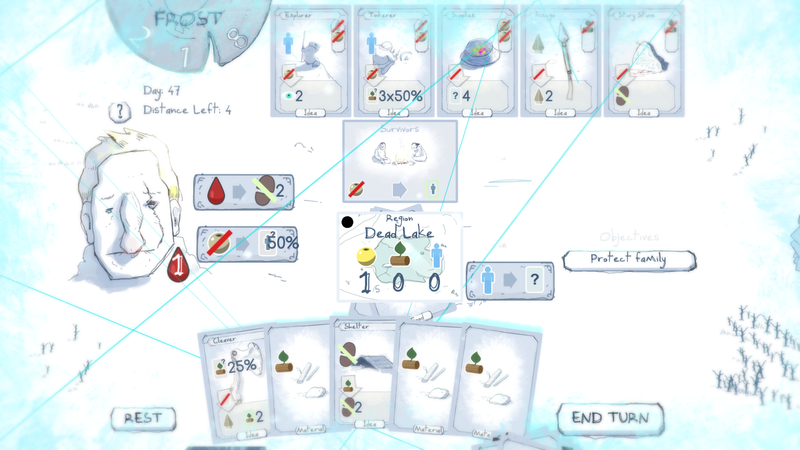 I’ve had some good times with Frost, and for seven Steam dollars I’d totally recommend any deckbuilding aficionado or clever game enthusiast to consider checking it out. But all the same, losing with a good deck to a series of unavoidable bad hands soured me on the experience before overlong. Take that into consideration for your travels, I suppose. Jarenth isn’t quite as good at writing buffers as he likes to think. Share time management tips on Twitter or hang out with him on Steam. 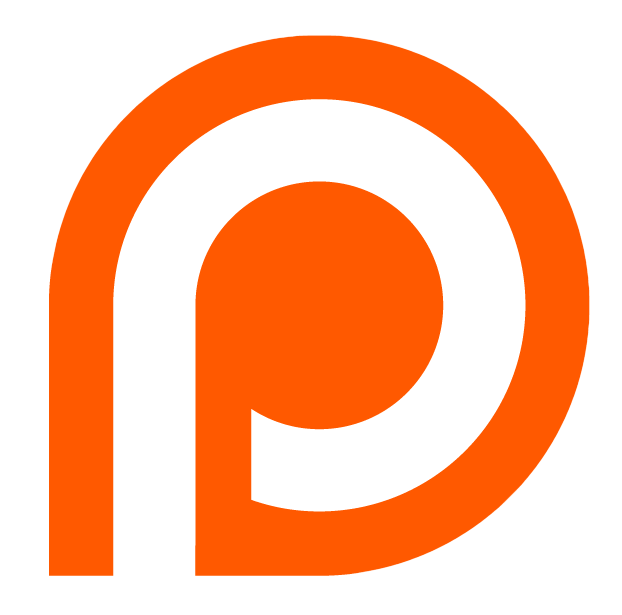 And if you dig Indie Wonderland and Ninja Blues in general, why not consider supporting our Patreon campaign? Sometimes I am really tempted to get a game you have just reviewed and then do a “Jarenth is a scrub” video. One where I spend a while trash talking, then play the game. Just not sure if the inevitable failure that ensues would be amusing enough to justify the effort. I can’t believe I’m getting disrespected on my own website.